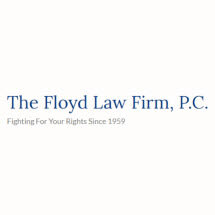 Since it was established in Saint Louis in 1959, The Floyd Law Firm, P.C., has fought for people injured or wronged in workers' compensation and personal injury cases. Our success rate is one of the highest throughout Missouri and southern Illinois. Success can be measured in many ways, one of which is a high recovery rate in settlements and jury verdicts. After an injury has left you with serious medical bills and unable to work or complete everyday chores, it is crucial you have lawyers who know how to obtain the maximum compensation you are entitled to receive. Our recovery rate is over 90 percent in workers' compensation and personal injury claims. At The Floyd Law Firm, monetary recovery is only part of our success. Attorney Walter L. Floyd built our law firm on the philosophy that everyone has a right to be treated fairly, a right to be heard and a right to get the compensation they are entitled to without intimidation or bullying from a large insurance company or employer. We pride ourselves on the fact that approximately 90 percent of our current clients have been referred to us by former clients. It is a testament to our ability to fight and win while treating our clients with the dignity and respect they deserve. If you have been injured or wronged, we are a law firm that will take a hands-on and dedicated approach to helping you obtain personal injury or workers' compensation. Call our office to schedule your free initial consultation.